A Murrieta woman convicted in the death of another driver in a traffic accident a year ago was sentenced Jan. 26 to four years in prison, the Murrieta Police Department announced Thursday. Taylor Suzzanne Channel, 18, received her sentence at the Southwest Justice Center in Murrieta from judge Kelly Hansen. Channel was 17 at the time of the accident on Jan. 22, 2017, but a juvenile court judge ruled in February 2017 that Channel should stand trial as an adult. The accident occurred at 9:06 p.m. at the intersection of Murrieta Hot Springs and Alta Murrieta. A Murrieta Police officer witnessed Channel speeding through a red light at Murrieta Hot Springs and Whitewood in a silver Chrysler 300, estimated to be traveling at 84 mph. The street was slick and partially flooded from rainfall as well. The officer pursued the vehicle with lights flashing but couldn't catch up to Channel before she ran another red light at Alta Murrieta while driving westbound. Her vehicle ran into a Toyota Yaris driven by 26-year-old Leah Jean-Lacher Reay, who was turning left on a green light from eastbound Murrieta Hot Springs onto northbound Alta Murrieta. The impact killed Reay on impact. Channel waived her right to a jury trial and pleaded guilty to a felony charge of vehicular manslaughter with gross negligence while intoxicated. She was found to be under the influence of alcohol and cocaine at the time of the accident. 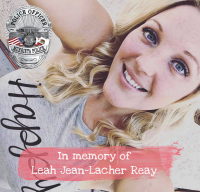 Officers have maintained a close relationship with Leah's family throughout the entire process. Three officers and a police chaplain attended the final court proceedings to maintain support for the family, according to a news release.